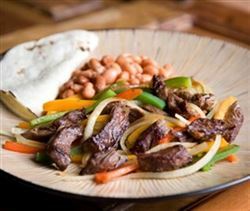 Place strips of skirt steak into a large bowl with CHEF LALA HOMEMADE FAJITAS MARINADE and stir until fully coated. Cover and place in refrigerator for 2-4 hours. Heat canola oil in a large skillet over a high heat. Remove steak from excess marinade and add to skillet. Saute� for 3 minutes.